The Red-Eyed Tree Frog is located in Southern Mexico, Central America including but not limited to Costa Rica, Honduras and Panama, and northern South America. Red-Eyed Tree Frogs are carnivorous and eat mostly insects, including crickets. They will also feed on other smaller frogs. Red-Eyed Tree Frogs inhabit lowland rainforest areas near ponds, streams and rivers. The Red-Eyed Tree Frog will be found near water sources that its offspring, tadpoles, will need to survive. Red-Eyed Tree Frogs will grow to be 2 cm (males) and 3 -4 cm (females) in length. The Red-Eyed Tree Frog is well known for its bulging red eyes and beautiful blue streaks and orange toes. When the Tree Frog sleeps it hides its sharp colors, but if it runs from a predator the bright colors may confuse or disinterest the predator. 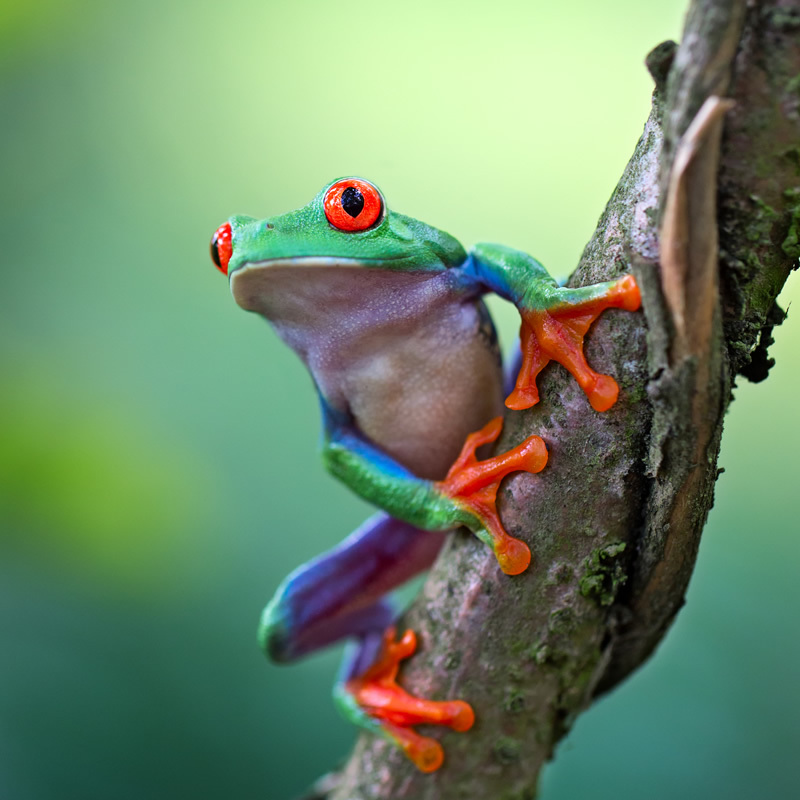 Like many Tree Frogs, the Red-Eyed Tree Frog has suction cups on its toes that enable it to climb trees and on leaves. Red-Eyed Tree Frogs will lay clutches of eggs on the underside of leaves that are standing above a water source. When the eggs hatch the fluid that was inside the eggs assist in washing the tadpoles down into the water.